Little Bird Tales is an excellent educational app to use with students to create presentations, narrate a story, and record podcasts. Using the integrated Art Pad, learners will be able to easily create digital storybooks. 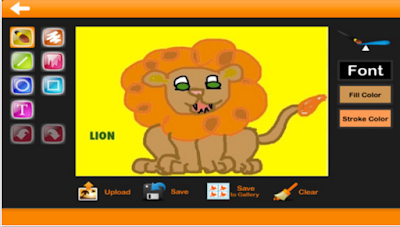 They can draw or upload their artwork and record their voice to illustrate their stories. The art pad also provides a wide variety of tools to edit images, change backgrounds, and draw using different colours. Little Bird Tales is also ideal for creating educational presentations to share with others online. Users can record their own voice and add a personal touch to the presentations they create. Teachers can use text and voice recording tools in art pad to create and customize lessons. There are also hundreds of ready-made interactive lessons and lesson plan templates tied to the Common Core which can be easily appropriated in one’s classroom. Little Tale Birds is also available for iPad and Chromebooks. You can download it from this page.